What would you do if you faced Ryan’s painful situation? When does a pain in the face start as a pain in the neck? Thanks to Ryan for posting this on to Facebook, and sharing his story. He experienced dramatic Jaw and TMJ nerve pain, and was going to be evaluated for trigeminal neuralgia. 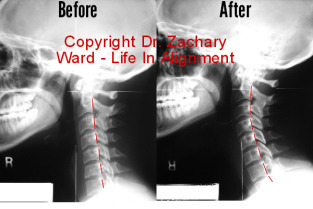 One gentle correction to his neck brought a quick change in his symptoms. “Around a month ago I had the absolute worst pain of my life for several weeks. Excruciating. Facial nerves on fire, worse every day. Wanted to rip teeth or part of my face off. TMJ. Primary Care Dr. was genuinely concerned, gave me Vicodin (didn’t help) and a medication used for controlling seizures which is protocol for given diagnosis. Now I was a zombie ..in pain. I certainly don’t understand medicine but this “solution” with no clear cause concerned me. 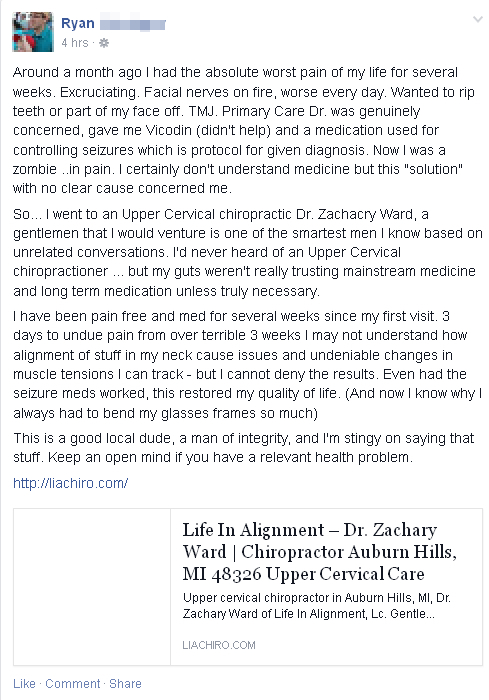 So… I went to an Upper Cervical chiropractic Dr. Zachacry Ward, a gentlemen that I would venture is one of the smartest men I know based on unrelated conversations. I’d never heard of an Upper Cervical chiropractioner … but my guts weren’t really trusting mainstream medicine and long term medication unless truly necessary.